Diatonic Scale: Ghosts of Gondwana (2016) by George Gibbs. Ghosts of Gondwana (2016) by George Gibbs. 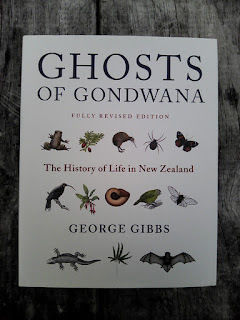 Really I acquired Ghosts of Gondwana (2016) because it has a number of good pictures and included as its subject matter a number of species I was interested in at the time. Its subject matter goes beyond my initial objectives and in this time of a predominant human centered world view with increasing urban population density, accelerating cultural change and overwhelming housing property prices this book represented a respite, looking into the natural world of which we are part of. 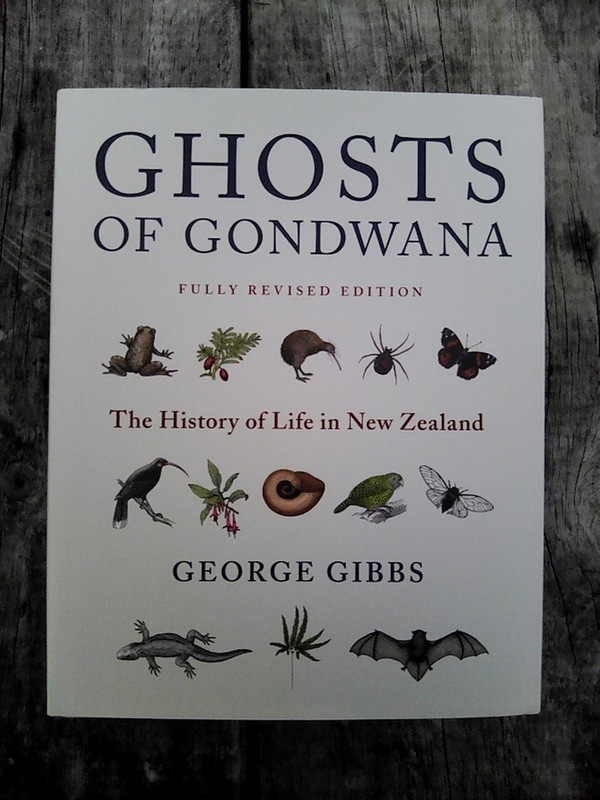 Ghosts of Gondwana (2016) can be understood as a book about the biodiversity of New Zealand. Its author introduces his subject by a reference to the landfall by Captain James Cook in 1769 at Poverty Bay, New Zealand, with Joseph Banks and David Solander noting the uniqueness of New Zealand flora and fauna. This is a book about the natural history of endemic life in New Zealand, detailing from evidence the various evolutionary origins of iconic and somewhat esoteric animals and plants in New Zealand, present before European colonization. The evidence is described in terms of historical biogeography, the processes of vicariance, dispersal and extinctions and relies on phylogenetic analysis, fossil evidence, tectonic geology and as Gibbs puts it "the clock hypothesis with all its faults" (Gibbs 315 : 2016). One point that Gibbs makes early on is that the idea of New Zealand flora and fauna as being survivals from a supercontinent of Gondwana, is simplistic. He recognizes that each endemic organism in New Zealand has a unique explanation, with the joke being that all life has historical explanations that reach into the Cretaceous. His point is that the separation of the New Zealand Pacific plate from a shared Australian, Antartic and South American plate around 80 million years ago allows this distinction of endemic New Zealand life having Cretaceous origins. Endemic organisms that do conform to a vicariance explanation with Cretaceous origins include flowing freshwater species, fresh water mussels Echyridela menziesii, Family Hyriidae (Kakahi), Scorpion flys (Family Nannochorista) and mayfly (Ameletopsis persescitus) (Gibbs 295 : 2016) due to restrictions on dispersal. Fresh water mussels (Kakahi) have an interesting relationship to Glaxiid fish (White Bait), as their parasitic larval stage relies on White Bait for nutrients and transport, introduced species do not transport mussel larvae (Gibbs 299 : 2015). Gibbs suggests a vicariance of the Hyrridae family prior to the disintegration of Gondwana, during the Jurassic. So the most common taxanomic level of endemism occurs at species level, when I can make comparisons, I will. The most probable dispersal sources of endemic New Zealand flora and fauna lay in Australia, due to proximity, yet aside from fossils, there are no snakes, turtles or crocodiles, no scorpions, no monotreme marsupials and no placental mammals. With the absence of placental mammals the niches that would be otherwise occupied are shown in endemic species such as the Ratites like the Moa and the emblemic Kiwi. The Kiwi is a carnivorous, nocturnal, burrow digging flightless bird that uses smell and has degenerated optic lobes associated with poor eyesight, which is unusual for a bird (Gibbs 242 : 2016). In the northern hemisphere this niche would probably be occupied by a mole or vole. I think this suggests that the Kiwi is a rather humble icon. The slow breeding rates of particular endemic species is noticeable, which is appropriate in cold environments where nutrition is a significant challenge and these include the Kakapo (parrot), Tuatara (Family Splendantia), endemic frogs (Family Leiopelmatidae) and endemic carnivorous land snails (Genus Powelliphantia) (Gibbs 284 : 2016). The discussion of vicariance and dispersal involves a discussion about plate tectonics and the submergence of a land mass described as Zealandia, (composition includes the Challenger Plataeu, Chatam Rise and Lord Howe Rise), during the late Oligocene around 23 million years ago of which unsubmerged Holocene New Zealand is part of. The degree of submergence has been debated, the presence of limestone indicates submergence (Gibbs 122 : 2016), Dr Hamish Campbell proposing that the geological evidence suggested a total or near total submergence with extinction events. George Gibbs mentions this theory but is critical of it. He discusses it in terms of the flora and fauna of New Zealand and a March 2013 Otago Daily Times article, "A Theory Flounders" appears to summarize this theories demise, or at least the movement towards a dialectical compromise. This is a large book, at 416 pages, but it would need to be. Its chapters individually are easily read at an undergraduate level and it presents a natural history explanation, or hypothesis for the species it covers which may make it a good reference book, as part of a starting point for further investigations. At the very least it provides a reasonable scope for understanding the biodiversity of New Zealand and currently, may be unique in its subject matter. George Gibbs. (2016). Ghosts of Gondwana. Published by Potton & Burton Publishing. Printed in Nelson. Pages 416.